Moustapha Bangoura hails from the West African nation of Guinea. 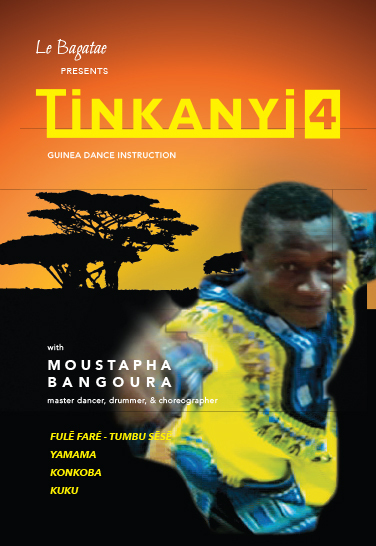 He is a 22-year veteran of the largest and most celebrated dance company from the continent of Africa - Les Ballets Africains The internationally acclaimed master dancer, drummer, and choreographer has traveled the globe bringing the colorful musical performance traditions of his homeland to audiences worldwide. Moustapha's mission is to continue to share his expertise while preserving the richness and authenticity of the culture. He is recognized for his thorough and charismatic technique that is deeply rooted in tradition. TINKANYI 5 AND 6 WILL ARRIVE DECEMBER 10, 2018! PRE ORDER TODAY AND RECEIVE FREE SHIPPING UNTIL DECEMBER 8, 2018! Tinkanyi 3 & 4. Order yours today! Le Bagatae is a 501C3 non-for-profit organization, please donate today to help keep our programming going.